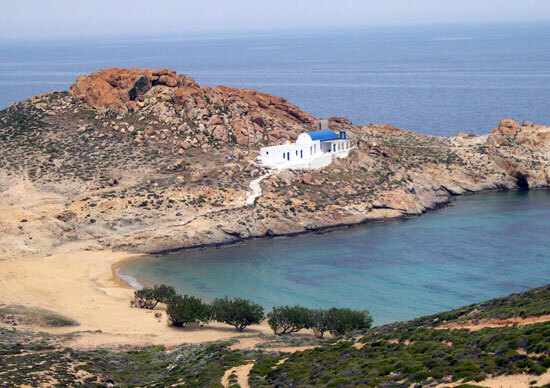 A pretty fair-sand beach on the east side of the island, Agios Sostis is not far from Livadi. A quiet beach, you can rest under the shade of the tamaris trees and admire the charming chapel on the hill. Up the hill from the chapel, on the headland, the eastern coast of the island comes into view and on a clear day other islands are visible. For some, Ganema is the best beach on the island. Located in the southwest of the island, the beach is large and clean with some shade here and there. The fresh fish at the taverna is quite good. Behind Ganema, vegetable gardens cover the plain and on the hill the castle of the "hurdy gurdy" dominates. One of the most visited beaches, the fine sand of Psili Ammos is shaded by numerous trees. The shallow bay and clear water make this beach a favorite for families with children. 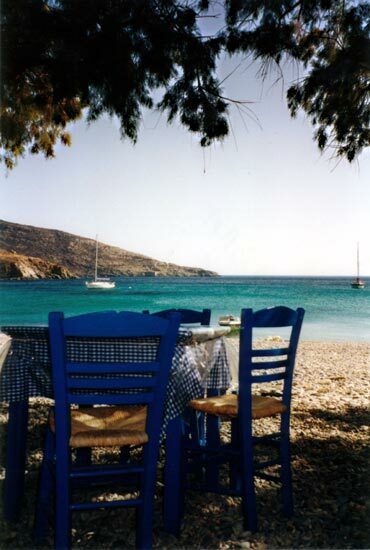 A pleasant lunch is available at the two tavernas there, or a magical dinner overlooking the bay lit by the moon. 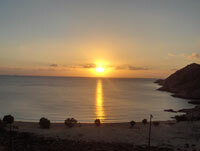 A splendid place on the wild north coast of the island, Plati Gialos offers two beaches. The largest has shade trees and the shallow waters make it a perfect swimming place for children. The other, a smaller beach, is quieter and close to a taverna where drinks and simple lunches are available. 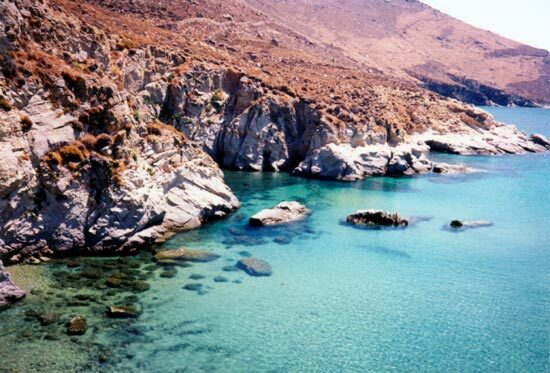 Kalo Ambeli is less visited than other beaches, no doubt because of the 20 - 30 minute walk necessary to get there. However, the effort is worthwhile as the fine sand beach is surrounded by moon-like stones which form small coves and the clean water kaleidoscopically takes the bay from greens to blues. This beach is only for those who can take strong heat and take precautions from the sun as there is no shade and only a swim will refresh you in this idyllic spot. Naturalists:Two beaches are officially reserved for nudists by the B.O.T. 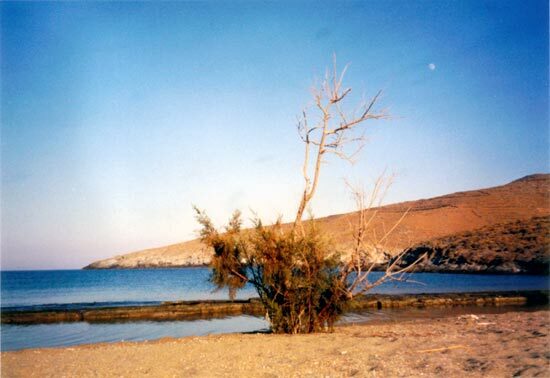 (organization of Greek Tourism): Karavi (just past camping and Livadakia) and Lea (near Agios Sostis).